We recently implemented a reward chart system for our girls. Basically, every time they successfully produce the desired behaviour (finish their food on time, go to sleep without fuss, etc), they will earn a fancy ink stamp on their charts. If they accumulate enough stamps, they get the reward they asked for. Guess what reward Sugababe 1 asked for? Yup. A cake. And not just any cake, but Rose Levy Beranbaum's Chocolate Banana Stud Cake. No, I don't mean that she actually said that. She's only 4, goodness. That would be too creepy. What I mean is that she found the object of her desire while leafing through my copy of Rose's Heavenly Cakes and decided that that would be her reward. I thought it was rather surprising that she wanted a 'reward cake'. As opposed to toys, books or dolls. But a cake. Oh well. Perhaps it's a little bit telling of what her mum spends too much time doing. Of course, Sugababe 2 asked for snakes. But that has nothing to do with me. So, after 20 days of good behaviour, it was time for me to make good on the reward. (I should add that Sugababe 2 was very excited about this, she reminded me no less than 4 times that I had to fulfil my promise). If there was ever a cookbook author who was a textbook high "C" on the DISC profile (think Monica on Friends), Beranbaum might just be the one. Extremely meticulous, each of her recipes is detailed down to the last letter, so that you will know exactly what to do. It is no secret that Beranbaum's recipes are rigorously tested, and that she approaches each one with the precision of a food scientist. That, coupled with the way she writes with such authority and exactitude makes me (admittedly a real meddler with recipes) guilty about varying it in the slightest degree. I mean, she doesn't just tell you to put in "one large banana". She lets you know that she means 112 grams of banana. So I dutifully ate up the extra 22 grams of banana. But hey, I am not complaining. Her meticulous style means that your cakes will turn out as promised. Just as mine did this time. Chocolatey, extremely tender-crumbed and deliciously fragrant with banana. Not like those heavy banana cakes that tend to be a little cloying, no. This one was full of flavour and yet light in texture and taste. Plus the white chocolate studs were just such fun to put on. SPECIAL EQUIPMENT: One 9 by 2-inch round cake pan, encircled with a cake strip, bottom coated with shortening, topped with a parchment round, then coated with baking spray with flour. MIX THE COCOA AND WATER: In a medium bowl, whisk the cocoa and boiling water until smooth. Cover with plastic wrap to prevent evaporation and cool to room temperature, about 30 minutes. To speed cooling, place it in the refrigerator. Bring it to room temperature before proceeding. PREHEAT THE OVEN: Twenty minutes or more before baking, set an oven rack in the lower third of the oven and preheat the oven to 375°F/175°C. MIX THE LIQUID INGREDIENTS: In a food processor, process the banana and sour cream until smooth. Pulse in the cocoa mixture, eggs, and vanilla and process briefly just to blend. MAKE THE BATTER: In the bowl of a stand mixer fitted with the flat beater, mix the flour, sugar, baking soda, baking powder, and salt on low speed for 30 seconds. Add the butter and half the banana-cocoa mixture. Mix on low speed until the dry ingredients are moistened. Raise the speed to medium and beat for 1 1/2 minutes. Scrape down the sides of the bowl. Starting on medium-low speed, gradually add the remaining banana-cocoa mixture in two parts, beating on medium speed for 30 seconds after each addition to incorporate the ingredients and strengthen the structure. The batter will be light but creamy. Using a silicone spatula, scrape the batter into the prepared pan and smooth the surface evenly with a small offset spatula. 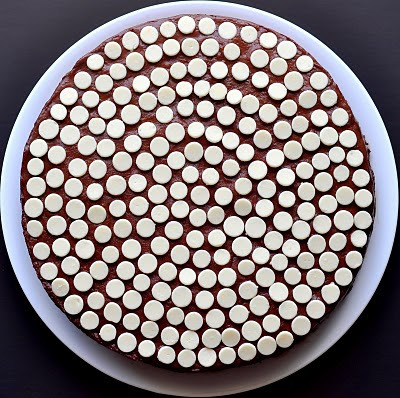 BAKE THE CAKE: Bake for 35 to 45 minutes, or until a wire cake tester inserted in the center comes out clean and the cake springs back when pressed lightly in the center. The cake should start to shrink from the sides of the pan only after removal from the oven. COOL AND UNMOLD THE CAKE: Let the cake cool in the pan on a wire rack for 10 minutes. Run a small metal spatula between the sides of the pan and the cake, pressing firmly against the pan, and invert the cake onto a wire rack that has been coated lightly with nonstick cooking spray. To prevent splitting, reinvert the cake so that the top side is up. MAKE THE GANACHE: In a food processor, process the dark chocolate until very fine. In a 2-cup or larger microwavable cup with a spout (or in a medium saucepan over medium heat, stirring often), scald the cream (heat it to the boiling point; small bubbles will form around the periphery). With the motor of the food processor running, pour the cream through the feed tube in a steady stream. Process for a few seconds until smooth. Pulse in the vanilla and liqueur or cream, if using. Scrape the ganache into a glass bowl and let it sit for 1 hour. Cover it with plastic wrap and allow it to cool at room temperature for several hours, until the mixture reaches frosting consistency. The ganache keeps for 3 days at room temperature, for 3 weeks refrigerated, and for 6 months frozen. COMPOSE THE CAKE: When the cake is completely cool, spread a little ganache onto a 9-inch cardboard round or serving plate and set it on top. If using the plate, slide a few wide strips of wax paper or parchment under the cake to keep the rim of the plate clean. Frost the top and sides of the cake with the ganache. 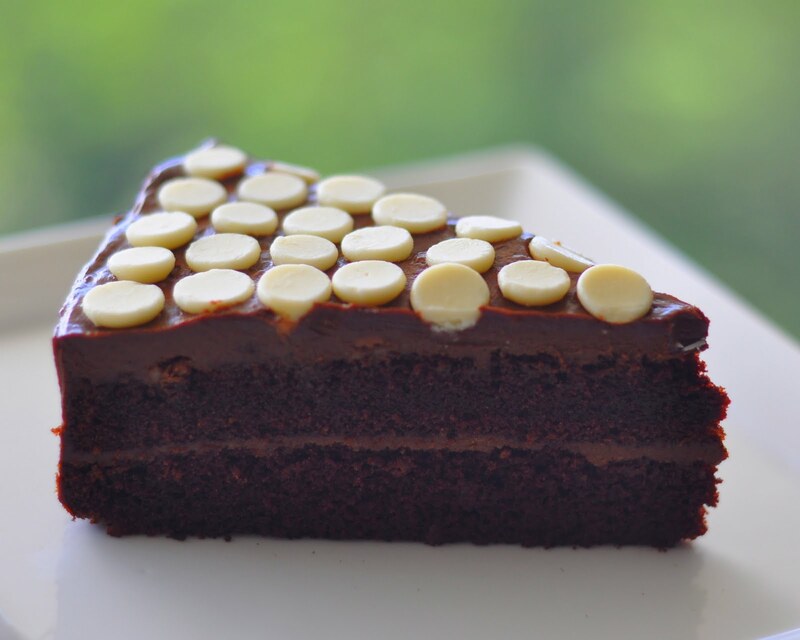 Stud the cake all over with chocolate chips, pointed ends in. It will take about 45 minutes to place the chips close together. Fewer chips more widely spaced also are very attractive. Or, if desired, form a design with a combination of dark and milk chocolate or peanut butter chips. If using the paper strips, slowly slide them out from under the cake before serving. Wow- this looks tasty! Love the studs look as well- very graphic. very pretty looking cake... looks delicious too! Wow, I wanna to behave to so I can make myself such a cake! It is so beautiful, I bet your 4 year old loved it. Slurrrrrrrppppssssssssss! If you could only see me drool, just imagining how it tastes. Wanz! Can I participate in this reward system too? Huh, huh, huh, please? This looks delicious! Your photographs are beautiful! Thank you for sharing your lovely baking. So inspiring. May I ask you what is a to cake strip? And why do I need to coat the bottom with shortening and top it with a parchment paper, then coated with baking spray with flour so many steps to oil the tin?? Thank you in advence for teaching me. As for the many steps taken to grease the baking pan, I believe Ms Beranbaum's instructions were a perhaps a little cautious due to the fact that the cake is rather tender and there is risk that it will stick and break apart easily if the pan is not properly greased. I baked mine in a non-stick baking tin, lined with parchment at the bottom and it turned out fine. To truncate the steps, I think you could just spray your tin (if not non-stick) with baking spray with flour, and then line the bottom with a parchment round and that should do the trick.